Based on a True Story–Beulah’s hate was deep. She would have killed them if she didn’t fear the school authorities would have come looking for them. They were “ugly” and “dirty,” her slaves. After the “big kids” disappeared and the family packed up to leave, the oldest half brother looked back out of the car window thinking his older brother and sisters were buried somewhere in the woods, left for the animals to eat. They were never mentioned again. Emily’s Story is the riveting true account of a child’s abuse and torture at the hands of her deranged stepmother and an uncaring father. After Emily’s mother dies in childbirth her father remarries. It’s just the beginning of a life of pain, fear and hunger, a struggle for survival, and of ultimate escape from a childhood gone terribly wrong. Emily’s will against the worst treatment and her self reliance against all odds is an inspiration to us all. 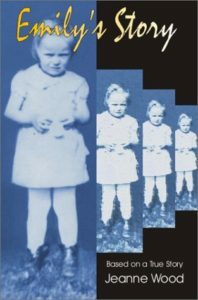 A must read for those who care about the welfare and abuse of children everywhere.